Has it been a while since your last scuba dive? Do you have a vacation to an exotic location coming up and you want to refresh your skills? 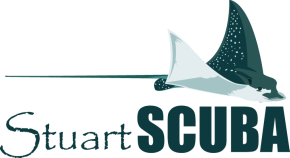 Stuart Scuba offers Scuba Review courses as a refresher for those who are already certified, but have not been in the water for a while. In less than one day's time, this course allows you to regain the confidence and comfort level needed to successfully make your next dive. We will review the knowledge and skills you learned from your original Open Water training. Then you will practice and refine those core skills in a pool or at the Blue Heron Bridge. Once you have completed the academic review and confined water skill reviews, you will have the option to expand your refresher course. The expanded review allows you to refresh your skills with a two tank drift dive off one of our boats, accompanied by an Instructor or Divemaster. If you wish to try Nitrox and learn how it can extend your bottom time, Stuart Scuba will include Discover Nitrox at no additional cost to your Expanded Review and Refresher course.